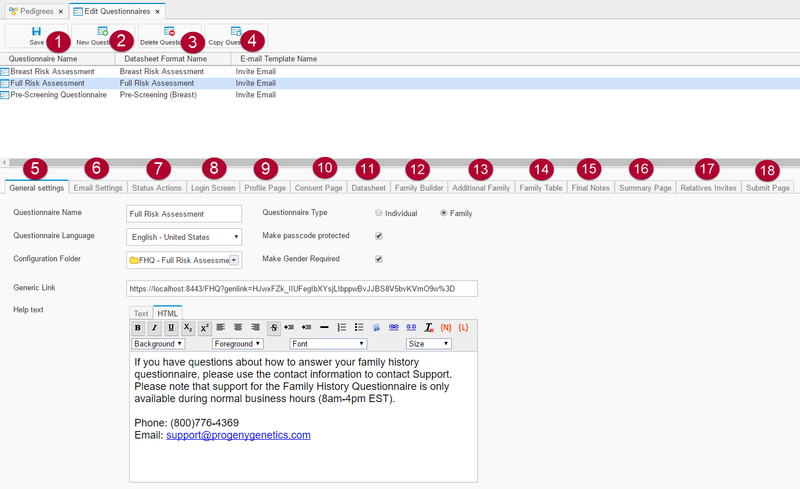 On this tab, you can edit the configuration for the different questionnaires inside of Progeny. Saves any changes that are made to the questionnaire(s). Creates a new questionnaire that can be customized. Copies the selected questionnaire and all its settings to a new questionnaire. Questionnaire Name – The name of the questionnaire. Questionnaire Type – Individual questionnaires ask about the individual while family questionnaires ask about the family. Questionnaire Language – the language of the questionnaire. Make passcode protected – enables a second factor for authentication in which a passcode is generated for the FHQ and has to be given to each patient that is sent the questionnaire so that they can begin. Configuration Folder – the folder that is configured in the web application backend to be associated with the selected FHQ. Make Gender Required – makes the gender field required for the questionnaire when being filled out. Generic Link – a link that is automatically created so that the FHQ can be accessed using the URL in a browser. Help text – help text that will be displayed when patients click the Help button throughout the questionnaire. Invitation Email – the invitation email template. Submit Email – the submit email template. Unfinished Email – the unfinished email template. Reminder Email – the reminder email template. Turn on Automated Reminders – enables the option to set up automated reminders. Remind Every – you can choose to send a reminder for the specified days/weeks. Max Number of Reminders to Send – you can specify the maximum amount of reminders that are automatically sent. Remind Once – you can choose to send a reminder once for the specified days/weeks. Before This Date – you can specify a field in the database that points to a date so that the Remind Once function can be applied to the date field. This section covers actions that take place once an invitation has the status manually set to Reviewed. Send Email – sends the specified email template. Who to Email – specifies to whom the email template will be sent to. Patient – sends the email template to the patient. Staff – sends the email template to the email that is specified in Email to notify from the Web Data Capture Configuration in the Progeny web configuration back-end. Both – sends the email template to both the patient and the staff. Move To Folder – moves the pedigree of the patient to the specified folder. Transmit Pedigree PDF to EMR – if an EMR has been set up with your database, this enables the pedigree to be transmitted to the EMR. Login Page title – the title of the login page. Login Page Instructions – instructions on the login page. Sign Up Page Instructions – instructions on the sign-up page. Add Profile Page – specifies if the profile page will be added to the questionnaire. Profile Page title – the title of the profile page. Datasheet Format Name – the datasheet format for the profile page. Add Consent Page – specifies if the consent page will be added to the questionnaire. Consent Page title – the title of the consent page. Datasheet Format Name – the datasheet format for the consent page. Datasheet Page title – the title of the datasheet of the questionnaire. Datasheet Format Name – the datasheet format for the questionnaire. Disable datasheet styles – disables the styles that are configured for the specified datasheet. You can specify which format to use for the Editor Style, Editor Label Style, and Added Text Style. Family Builder Page title – the title of the Family Builder Page. Family Builder Page Instructions – instructions for the Family Builder Page. 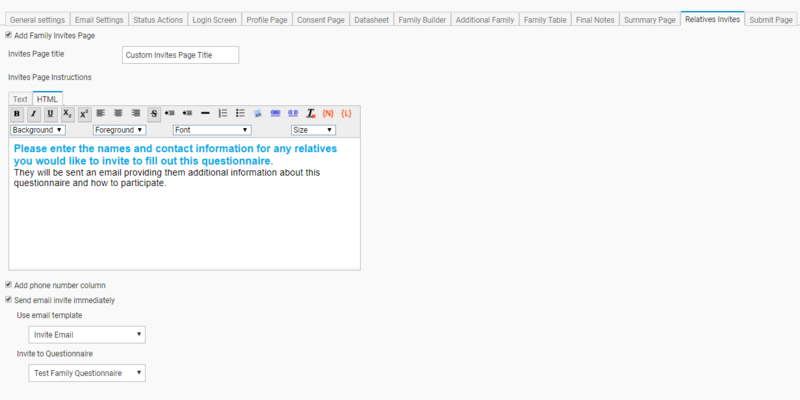 Show Only When Conditions Below is True – you can specify to show the family builder page by a condition. Add Nieces and Nephews Page – specifies if the Nieces and Nephews Page will be added to the questionnaire. Nieces and Nephews Page title – the title for the Nieces and Nephews Page. Nieces and Nephews Page Instructions – instructions for the Nieces and Nephews Page. Add Cousins Page – specifies if the Cousins Page will be added to the questionnaire. Cousins Page title – the title of the Cousins page. Cousins Page Instructions – instructions for the Cousins Page. Add Half-Siblings Page – specifies if the Half-Siblings Page will be added to the questionnaire. Half-Siblings Page title – the title of the Half-Siblings Page. Half-Siblings Page Instructions – instructions for the Half-Siblings Page. Family Table Page title – the title of the Family Table Page. Family Table Instructions – the instructions for the Family Table Page. Add Final Notes Page – specifies if the Final Notes Page will be added to the questionnaire. Final Notes Page title – the title for the Final Notes Page. Page Instructions – the instructions for the Final Notes Page. Show pedigree upon completion – specifies whether to show the pedigree on the summary page and whether to display it for all members who fill out the questionnaire or only the Proband of the family. Show data editors – specify if the data editors are shown on the Summary Page. These editors are used to modify information in different sections of the questionnaire. Summary Page title- the title of the Summary Page. Summary Page Instructions – the instructions on the Summary Page. Empty Summary Page title – the title of the Empty Summary Page. Add Family Invites Page – specifies if the Family Invites page will be added to the questionnaire. Invites Page title – the title of the Invites Page. Invites Page Instructions – the instructions for the Invites Page. Add phone number column – adds a phone number column. Send email invite immediately – send the invite immediately. Use email template – uses the specified email template for relatives. Invite to Questionnaire – specifies the questionnaire to be sent to the relatives. Submit Page Title – the title of the Submit Page. Submit Page instructions – the instructions on the Submit Page. Lock on submit – locks the questionnaires once they have been submitted. This prevents accessing the questionnaire again and changing information. Move on submit – moves the pedigree to the target folder once a questionnaire has been submitted.